On May 22, 2011 Joplin, Missouri was struck by a large mile wide tornado that ravaged its way through the southern part of the city. An entire landscape was torn apart with many people killed and injured. Days after the tornado, the death toll kept rising: 24, 89, 124, 150 and finally settling at 161 people perished. The Joplin twister was the deadliest since the Woodward, Oklahoma twister in 1947. 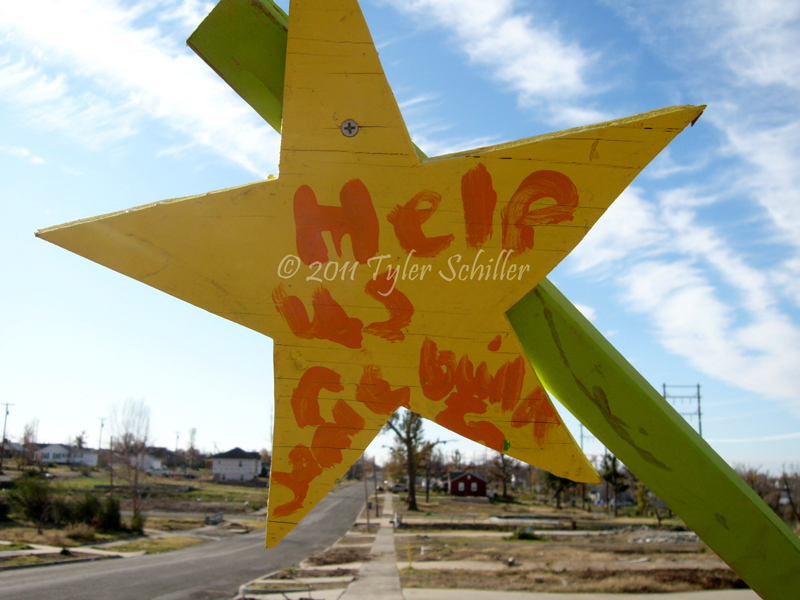 My family had the opportunity to visit Joplin, Missouri for the second time in two years and witness the horrible devastation. From a television perspective, the scenery didn't do justice when they saw the damage from their own eyes. 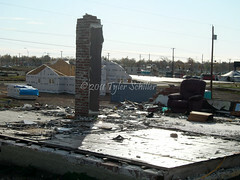 Here are some of the photos within the EF5 damage path where many citizens lost their lives in Joplin. St. John's Regional Medical Center was the iconic landmark when the Joplin Tornado first hit the southwestern side of the city. According to the National Weather Service, the tornado was at EF4 strength when it struck St. John's Regional Medical Center. The media that arrived on the scene, moments after the twister, aired live video of the damaged hospital and the destruction surrounding it. Numerous cars were flipped over and destroyed. Trees were debarked and houses completely destroyed.St. John's Regional Medical Center is projected to be torn down since engineers have found the foundation was compromised due to the strength of the tornadic winds. Across the street from the hospital (looking west) on McClelland Blvd were homes and a small strip mall that once stood, but it was destroyed by the Joplin, Missouri twister. 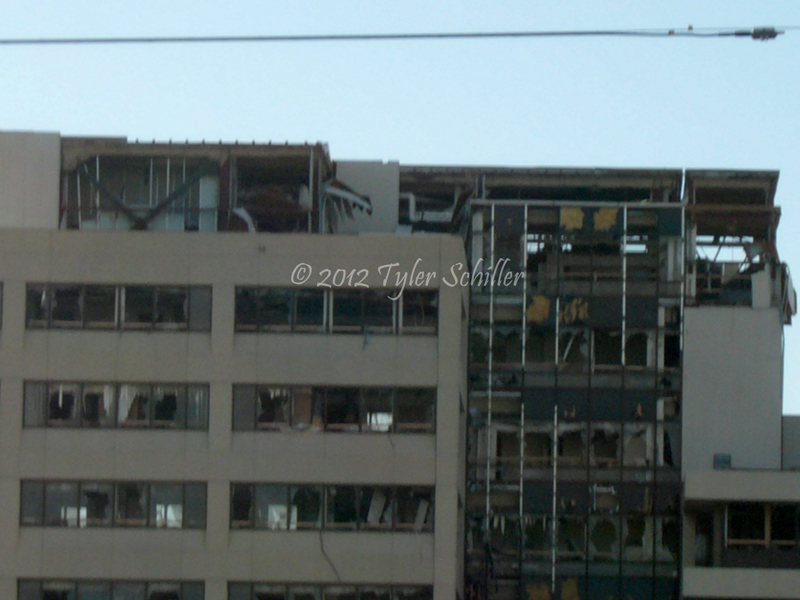 Joplin Tornado Damage - The Medical Center standing vacant with mostly all of the windows blown out. 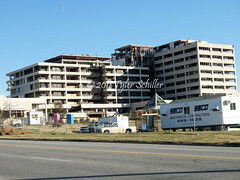 The Medical Center (right picture) is what it looked like before the Joplin Tornado hit. Joplin Tornado Damage - Across the street from the Medical Center on McClelland Blvd was a small strip mall that housed offices along with homes behind the building. 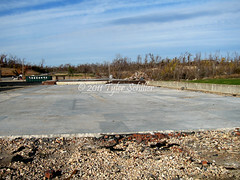 Everything was wiped out (left picture) by the tornado. The picture on the right shows the strip mall before the tornado hit. 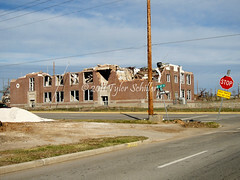 The Joplin Tornado moved east, northeast of the St. John's Regional Medical Center and traveled parallel to 26th Street towards South Main Street. At this point the tornado became large than a half mile to 3/4 of a mile in width. The tornado was now producing EF5 damage in this region. A dentist office and the Irving Elementary School sustained major damage. Just after this photo was documented, the Irving Elementary School was torn down. Two blocks north of Irving Elementary, South Middle School sustained damage with a large hole shown below. 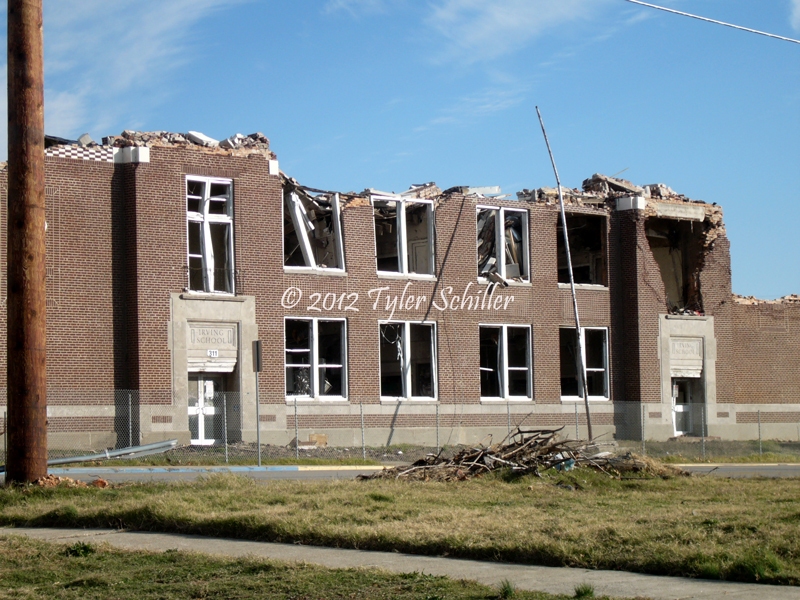 Joplin Tornado Damage - Irving Elementary School (left picture) destroyed by the EF5 tornado along 26th Street. Before the twister, (right picture) trees, houses and traffic lights covered the landscape. 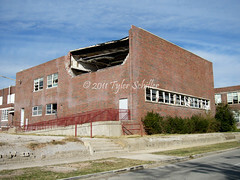 Joplin Tornado Damage - Pictures show heavy damage at South Middle School on South Wall Street and 23rd Street. A Dentist office on 26th Street damaged all within the EF5 damage path. A few blocks east, the tornado continued to cause EF5 damage. Here is a house on 24th Street and South Wall Avenue. The neighborhood before the tornado (shown on the Google Street view) is something to be expected with houses, trees and roads, that resemble a normal neighborhood. 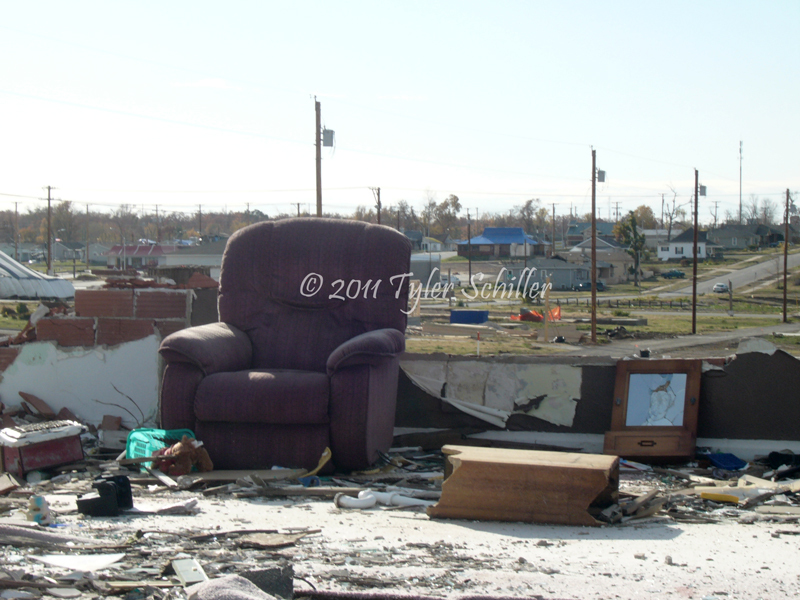 The home was destroyed with a vacant chair sitting to what was a living room. The wood porch was the only thing left on the foundation. With the help of Google Street view, I found the same house with the wood porch before the tornado wiped out this neighborhood. 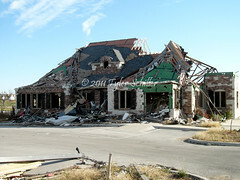 It's pretty astounding how an EF5 tornado can damage the landscape to make neighborhoods unrecognizable. Unfortunately, you are left to wonder what happened to the people who lived in these homes on this block. 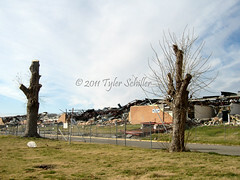 Joplin Tornado Damage - This entire block was leveled by the EF5 tornado (left picture). Note the Taco Bell in the background a couple of blocks to the southeast. The block looked normal with houses and trees before the Joplin Tornado had wiped it out (right picture). Joplin Tornado Damage - The wood porch is all that is left of this home (left picture). The house (right picture) is what it looked like before the twister. Note the wood porch at the front of the house. The tornado continued to be large and maintain EF5 intensity as it moved towards the Joplin High School on Iowa Avenue and 20th Street. The Franklin Technology Center across the street from the High School sustained major damage shown below. Here are Google photos of what it looked like before the tornado hit. This intersection was filmed moments after the tornado had destroyed the Franklin Technology Center by Storm Chaser Jeff and Kathryn Piotrowski. The video of the tornado and their efforts to find survivors is shown below. Joplin Tornado Damage - Franklin Technology Center damage (left picture) along Iowa Avenue and 20th Street. The Technology Center before the tornado (right picture). 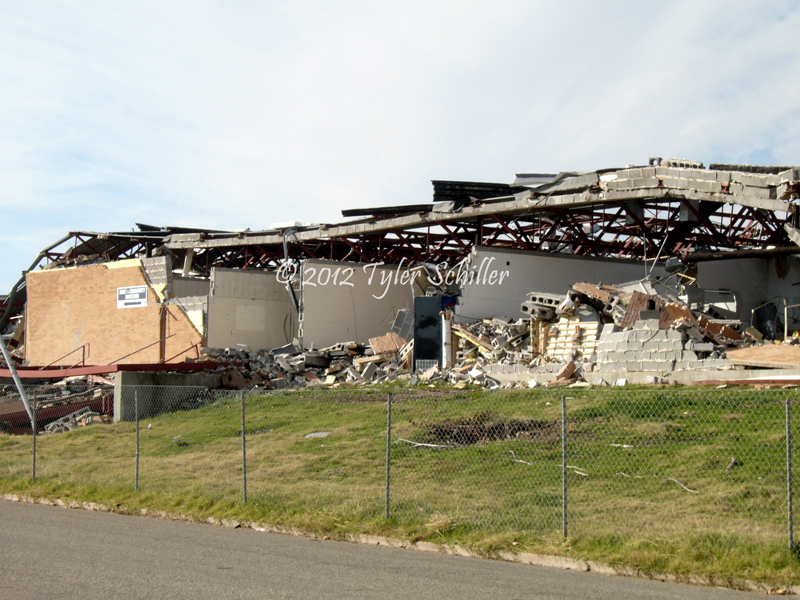 Joplin Tornado Damage - Closer look at the front of the Technology Center (left picture), while it is shown fully intact before the tornado (right picture). 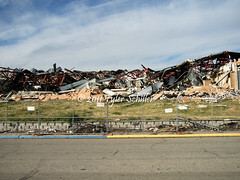 The Joplin Tornado continued to move east and damage many houses, commercial buildings, including the Walmart and Home Depot along 20th Street and Range Line Road. The Fast Strip gas station along 20th Street was destroyed, however over 20 people had huddled in a cooler and all survived. One of the survivors had their cell phone recording video and captured the entire event as the tornado ripped the gas station apart. Earlier on May 22, James and I were out chasing in western Wisconsin as this area was also under the gun for severe weather. We sat in Barneveld, Wisconsin in the afternoon for two hours waiting for storms to form. As we killed time, James and I were stationed at nearby gas station. Across the freeway was the village of Barneveld where its water tower had to been standing tall. The village was hit by a F5 tornado on June 8, 1984. The water tower was the only symbolic feature left standing when the tornado killed 9 people, injured over 200 and left damage in the millions. We looked around and couldn't see any visual damage marks from the twister. Ironically, later that afternoon, some 500 miles away, Joplin, Missouri would have their own stories of survival, death and heroism. 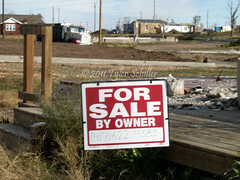 Joplin will too rebuild and the landscape will heal just like it has in Barneveld, but it will take years to come. God Bless the victims and families.